In this case, it presented a video, that I clicked, about the Moon 2 Mars NASA plans. At about 9 minutes in, the NASA administrator starts talking about the X-59 demonstrator that will be used to show we can do Super Sonic over land over the USA without bothering folks. Really? While I like sonic booms, and remember them from when I was a kid a few dozen miles off the end of the Air Force Base where the SR-71 was based, and while watching it “cook out” especially at night forever hooked me on aviation… I know that some folks are not enamored of having a big BOOM! and all the windows and dishes rattle. Well, NASA thinks they can turn a Sonic Boom into a modest “thump”. I’m not sure folks will be all that keen on lots of “thump, thump, thump” overhead, but hey, going a few hours to the other side of the world could be worth it. The whole idea seems to be fancy aircraft design + flying at 50,000+ feet. I think that could work. The Lockheed Martin X-59 QueSST (“Quiet Supersonic Transport”) is an American experimental supersonic aircraft being developed for NASA’s Low-Boom Flight Demonstrator program. Preliminary design started in February 2016, with the X-59 scheduled for delivery in late 2021 for flight tests from 2022. It is expected to cruise at Mach 1.42 (1,510 km/h) and 55,000 ft (16,800 m), creating a low 75 Perceived Level decibel (PLdB) thump to evaluate supersonic transport acceptability. The Low-Boom X-plane will be 94 ft (29 m) long with a 29.5 ft (9.0 m) wingspan for a max takeoff weight of 32,300 lb (14,700 kg). Propelled by a single General Electric F414, it should reach Mach 1.5 or 990 mph (1,590 km/h), and cruise at Mach 1.42 or 940 mph (1,510 km/h) at 55,000 ft (16,800 m). The cockpit, ejection seat and canopy come from a Northrop T-38 and the landing gear from a F-16. Its engine will provide 22,000 lbf (98 kN) of thrust. The ground noise is expected to be around 60 dB(A), about 1/1000 as loud as current supersonic aircraft. This is achieved by using a long, narrow airframe and canards to keep the shock waves from coalescing. It should create a 75 Perceived Level decibel (PLdB) thump on ground, as loud as closing a car door, compared with 105-110 PLdB for the Concorde. The central engine has a top-mounted intake for low boom, but inlet flow distortion due to vortices is a concern. The long and pointed nose-cone will obstruct all forward vision. The X-59 will use an enhanced flight vision system (EVS), consisting of a forward 4K camera with a 33° by 19° angle of view, which will compensate for the lack of forward visibility. United Technologies subsidiary Collins Aerospace was selected to supply its Pro Line Fusion Cockpit avionics, displaying the boom on the ground, and EVS with long-wave infrared sensors. The Collins EVS-3600 multispectral imaging system, beneath the nose, is used for landing, while the NASA external vision system (XVS), in front of the cockpit, is giving a forward view. Man that’s one long nose… Wonder how that will do scaled up to 737 size and at JFK? 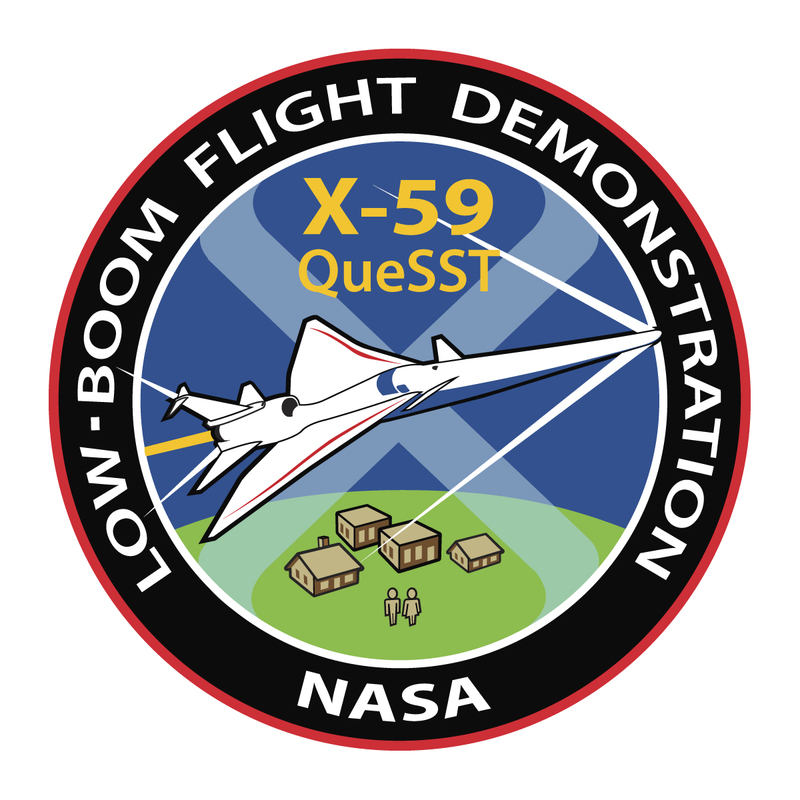 The X-59 designation has been added to the graphic for the Low-Boom Flight Demonstration mission, which depicts the two key aspects of the effort – the X-plane and the community overflight campaigns it will later fly. Artist concept of a low-boom flight demonstrator in flight over land. In several years, the X-59 QueSST will test its quiet supersonic technologies by flying over communities in the United States. But 2022? For the demonstrator? THEN a year or two of testing. THEN a year or two for congress to do something other than Bash Trump, THEN only if the Dimocrats are not in power and the Green Dream Nightmare has been recognized as daft… so about 2026 we could START design of the commercial planes… and about 2029 at the best they would go into type testing so MAYBE about 2032 approval and building and then about 2035 commercial service would be available… Let’s see… 2035-2019 is 16 years, so I’d be about 82. Damn. This entry was posted in Tech Bits and tagged NASA, Sonic, SST, Super. Bookmark the permalink. 14 Responses to Return Of SST Transport? The concepts for air traffic management are changing allowing aircraft to fly trajectories that are efficient for the aircraft (in Europe they are called business trajectories) this allows a larger spread of performance. Extended range aircraft in commercial service can already fly from any airport direct to any other airport but passengers are airborne for 15 hours or more. So there is now significant research into hypersonic flight. There are many approaches being taken to this with research into ‘near space’ hypersonics see https://www.planeandpilotmag.com/article/boeing-unveils-hypersonic-transport-plane/ and similar. Whether these aircraft have an economic business case is part of the research. They are very unlikely to make the economics work and even less likely to make the ecologics work. Maybe, just maybe it could work for a billionaire’s bizjet. Cos billionaires don’t care who hates them. Military use, yes of course. The Jimmy Durante QueSST? Hubba, Hubba, Hubba! My father was involved with the engineering on the North American Aviation Vigilante (A-3J, later A-5), which was the predecessor of the Blackbird. Back when, they would do their flight testing near the production facilities and we lived nearby. Lot’s of BIG kabooms! All of us kids loved the kabooms. Napping babies? Not so much. My grade school was roughly 8 miles away from the facility and we could hear the engines at school when they had a plane up against the fire wall for testing. I can’t recall when it was, but the powers that be finally had them put some sound barriers around the test wall and the thrill was gone. @rhoda klapp: I think you’re probably right about the economics and the potential end users. There will probably be a few routes between major business cities that can keep a plane filled and profitable, but obviously no one is going to book a flight to take the kids to Disneyland. I didn’t notice how much runway was required for landing. I’ll have to assume they are planning on using existing runways. I’m sure they will come in fast, but they have got to be easier to stop than a massive jetliner. So isn’t there some altitude (like maybe 60,000 to 100,000 feet) where you can do a couple of Mach and not have added fuel burn due to the air being so thin? Plus, fuel burned to get to Mach and altitude means you have a nice long “coast back to ground” at the other end with engines throttled back. It looks to me like the biggest issues are not going to be fuel cost, but the number of seats and the $Billions to make the plane. Are there really enough folks flying 1/2 way around the world regularly to make enough money to pay off the development costs + manufacturing costs? Then there’s that small problem of “Get to the airport 2 hours early to get through security screening” for a 2 hour flight… Add in an hour at the other end to get luggage and ground transportation, pretty quick you reach a 5 to 6 hour total. That’s already my situation for Los Angeles. It’s about a 2.5 hour flight, but ends up being about 6 hours “door to door” and I can drive it in about 6.5 hours “door to door”. So I no longer fly to anywhere that’s about an 8 hour drive or less. So layer all that crap on top of the whole trip… It looks to me like it might be useful for “coast to coast” but frankly, at about 5 hours IF they would just return to non-stop and get rid of the now nearly obligatory 4 hours extra at a “hub” somewhere in the middle, THEN the widebody would be competitive. The overall flight start to end at 2+5+1= 8 vs 2+2+1= 5 are you really going to “pay up” for 3 hours less when it is pretty much going to shoot your day anyway? Even there, the 2 hours is generous since there will be ground positioning time, take off, climb out etc before you can start to hit speed. I’ve allowed 30 minutes at each end for that “approach” space and an hour in between at speed; it could well be longer. Oh, and that air breathing British Rocket / Jet is way cool and I’d love to see it flying too. Which brings up the question of what happens to Bezos and Virgin Galactic if folks can be at the edge of space on commercial intercontinental flights? Are you really going to pay $200,000 for 5 minutes of zero G if you can catch a flight from London to Sydney and be effectively on the edge of space? Or perhaps even really sub-orbital and zero G? I wasn’t even thinking of fuel costs. I forgot all about it. The old SST had the same problem of filling the seats, and there were darn few seats. Definitely intercontinental is the market. One thing that occurred to me… we have an old air base at the south end of town that is now only used by the Air National Guard, so the hangers were more than half empty. They declared the base an International Trade Zone, which was good for local businesses that imported and exported, and an air freight company or two has it as one of its destinations. What is really cool is they put in a small passenger terminal and a small airline set up and runs really cheap flights to Florida. They go once per day to Orlando, Tampa Bay, Miami, and… I think one more city. Did I mention cheap? It’s $100 plus something for a round trip ticket. Needless to say all flights are pretty much fully booked. Anyhow, those old bases that now share commercial traffic would be perfect for the QueSST. They have plenty of runway because of the old military cargo planes, there are a lot of those bases near large cities, and busy execs would not have the 2-hour wait that the major airports are known for. Heck! Use the corporate jet or a helicopter to hop down to one of those SST terminals. There’s plenty of ‘parking.’ That might make the difference between commercial success and failure. So isn’t there some altitude (like maybe 60,000 to 100,000 feet) where you can do a couple of Mach and not have added fuel burn due to the air being so thin? I think the SR-71 experience answers that question – when they were worried about fuel usage they solved the problem by going faster . The SR-71 engines actually used less fuel at higher speeds (probably also altitudes because flight in very thin air becomes easier at higher speeds). As I recall operating altitude of SR-71 was around 60,000 – 85,000 ft. Minimum fuel burn on a SR-71 cockpit reference document was plotted as FL 78-82 at M 3.2. The J-78 spec curves extended to M 4.2, for what that was worth. NASA facility near Cleveland, Oh. did some work upon shock wave suppression by magnetic manipulation of an artificial plasma sheath. The system only becomes practical above Mach 2 in the dry air found at altitude. The answer to supersonic flight is simply to make the planes a lot smaller. Autonomous 1-2 person drone passenger planes would weigh 1-2% as much and produce 1-2% of boom power – or about 20dB quieter. They could also incorporate ballistic parachutes and be launched from catapults etc to make it even easier. Small ramjet engines are just as efficient as large ones. Fuel them with liquid hydrogen and fly them even higher and they can have global range with just about no noticeable noise at ground level. Small planes are also far cheaper to develop. @Foyle – SSTs? Supersonic Taxis? I live on the Welsh coast and the Concorde flew over twice per day, we could hear the Sonic boom as it accelerated or decelerated over the sea, it was great. I used to listen to the Pilot talking to UK Air Control on an Air Wave Radio. We were very sad when it was retired from service. British Aerospace and Rolls Royce design the HOTOL long range Orbital Space Plane back in the 80s, but it was never financed. The long nose of the airframe is a design feature to make commercial flights even faster. Passengers will board at the rear of the plane, walk to the front during flight and then debark from the front of the plane. That will save almost 100 feet of travel distance on every flight.